• Why are first-test pass rates in some European countries better at four years than UK pass rates after three years? • Does the three-year UK MoT test unnecessarily "gold plate" the European minimum requirement for roadworthiness – at a cost to UK motorists of £465 million a year? • Would the application of European minimum standards be enough to guarantee roadworthiness of UK cars? • Is there any evidence that accidents due to vehicle failure are greater in countries that wait four years for a first compulsory roadworthiness test? 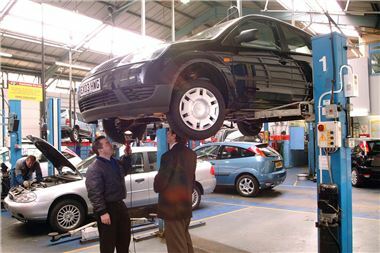 • In the UK, only garages carry out tests and supply the parts and labour needed to rectify faults. In some European countries, testing and rectifying procedures are separated - should we consider the introduction of independent testing centres? In 2007, 21.6 per cent (580,754) of three-year old cars failed their first test. Figures supplied to the IAM Trust by European motoring organisations show that in some countries where they apply the EU-minimum four years for the first roadworthiness test, the failure rate is lower than in the UK (21.6 per cent), eg France 5.61 per cent, Switzerland 17.5 per cent and Norway 19.9 per cent. However, the failure rate in Spain is higher than the UK, at 32 per cent. In countries that also test for the first time at three years, failure rates are far lower than in the UK (Germany 4.8 per cent and Austria 10 per cent).